What an amazing turnout for our Westside Story event at TechSquare Labs on October 2! Atlanta community leaders, nonprofits, sponsors, and TechBridge board members showed up in force to celebrate community collaboration aimed at disrupting the cycle of generational poverty in Atlanta’s historic Westside neighborhoods. We also launched a crowdfunding effort aimed at helping a special local nonprofit. 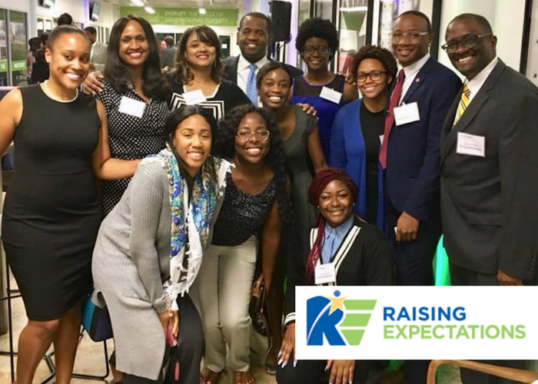 Raising Expectations Co-founders Maria Armstrong and Tangee Allen showcased the work that their nonprofit is doing on the Westside to empower youth in crises by raising academic, social and civic expectations to facilitate high school graduation and post-secondary plans. Raising Expectations is our crowdfunding beneficiary, and we want to rally all of you to help them reach their goal of raising $10,000 for a technology transformation that TechBridge will deliver. For those who weren’t able to join us, you still have the opportunity to help. Feel free to share this link with your colleagues and friends to reach this goal. The success of the Westside is essential to the growth of our city. With the new Mercedes-Benz Stadium as the backdrop, the Westside of Atlanta is experiencing rapid transformation, yet with 60% of children in Westside neighborhoods living in poverty, the area is still ripe for change. We are truly excited about our work in partnership with the Atlanta Regional Commission and Westside Future Fund to create a Westside community dashboard. This dashboard will help to realize a vision for the future of the neighborhoods of Atlanta’s Westside, particularly around four areas of impact: mixed-income communities, safety and security, cradle to career education, and community health and wellness. In addition, we are dreaming big for the future of these communities and developing a concept to directly support residents and families. This will come in the form of a technology training program to support Atlantans ages 18-24 and ensure that they have the skills needed for middle-income employment. Partners in this work include Georgia Tech, Atlanta Housing Authority, Oakwood Development, CodeStart, and Atlanta-based employers, all of whom are eager to support our next generation together. Monday’s event featured an exciting mix of attendees. Community leaders including Atlanta mayoral candidate and Atlanta City Council President Ceasar Mitchell, Blank Foundation representative Angela Blank, Atlanta Community Food Bank founder Bill Bolling, Westside Future Fund Executive Director John Ahmann, Georgia Tech Director of Community Relations Christopher Burke, and Inclusion + Equity partner Rodney Sampson were joined by TechBridge board members, staff, super volunteers, nonprofit partners, and representatives from organizations working on the Westside including Invest Atlanta, Urban Asset Builders, Wright Now Solutions, and United Way of Greater Atlanta. We are so excited to have you join us on our journey this year to truly make an impact and support the nonprofits who work so hard on the frontlines of community change. And remember, one easy way to make a difference is to make a donation to help Raising Expectations meet their crowdfunding goal. Follow TechBridge on Facebook, Twitter, LinkedIn and Instagram to get the latest news.